The 280SE was just above the base model 280S, which had a carburetor, while the SE ran Bosch D-Jetronic fuel injection. The engine in this car is the famous (or infamous) M110 double overhead cam six cylinder. Don’t those words (double overhead cam six cylinder) give you a warm fuzzy feeling inside, even if it’s irrational? The car wears California sunrise plates, which means it’s been there since the early 1980s at least. It’s clearly had some level of federalization, with sealed-beam headlights (you’ll want to retrofit the European ones) and a speedometer showing miles per hour. Perhaps it no longer passes smog? The interior looks decent from this one shot, but warrants further inspection. The hardwired cell phone is a neat touch, although not exactly period for 1977, and the manual window winders are a great tip off to the car’s origins. 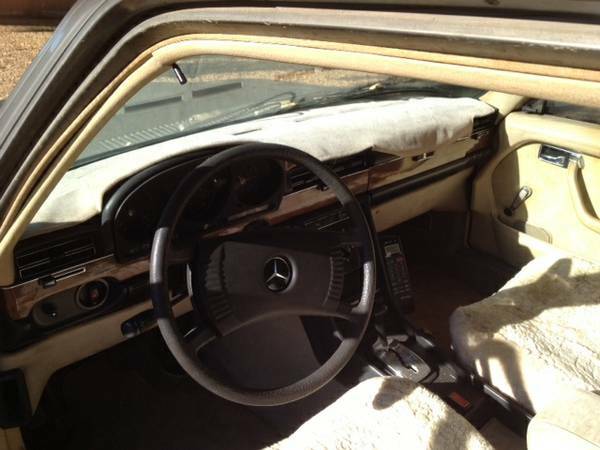 What are the odds you get that awesome, amazingly durable corduroy-looking Mercedes velour on the seats? The car is said to only have 95,000 miles, although you should take that with a grain of salt due to the aforementioned fitting of a mph speedometer. Either way, on a car of this age, overall condition is more relevant than miles traveled. Nothing dramatic from this angle either. The grey color looks a little modern for 1977, and these cars did not originally have fender-mounted indicators, plus the horizontal surfaces appear oxidized (or just dirty from 9 years’ storage). 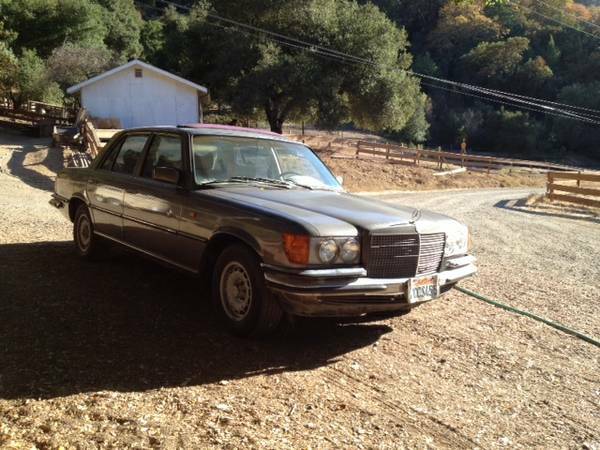 But for a three-digit price, a running, driving Mercedes that shifts properly is the right car to take as far as possible on the interstate, playing Kraftwerk and flying along in the left lane. This entry was posted on January 6, 2013 at 8:15 pm and is filed under Feature. You can follow any responses to this entry through the RSS 2.0 feed. You can leave a response, or trackback from your own site. 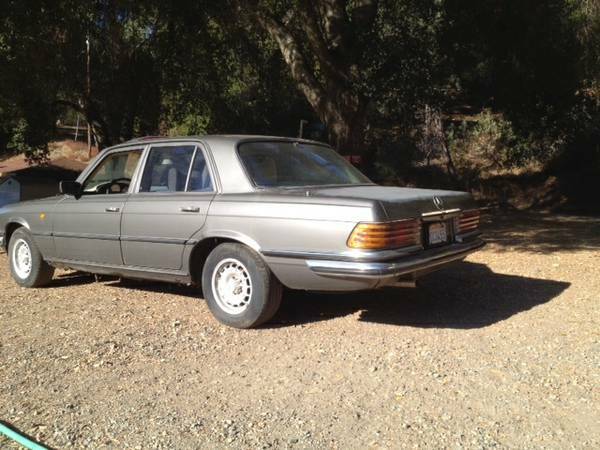 I saw a very similar car at the dealer auction several months ago; it was US model and a 75 but it had 90K miles, working air, a nice interior, a Becker Europa, and no rust that I could find, it ran well too, I bid it to $750 and I let it go because my business partner gave me the “evil eye”; it sold for 800 to someone else and whoever that was, sold it someone local who drives it regularly. I see it all the time. The only thing keeping me from trying to buy it is smog testing… this is an even better deal than when I picked up my Alfetta for $250.